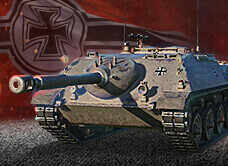 Let's give a warm welcome to the Kanonenjagdpanzer which you will see more often in the Premium Shop. This tank destroyer stands at Tier 8. It can move and fire quickly. 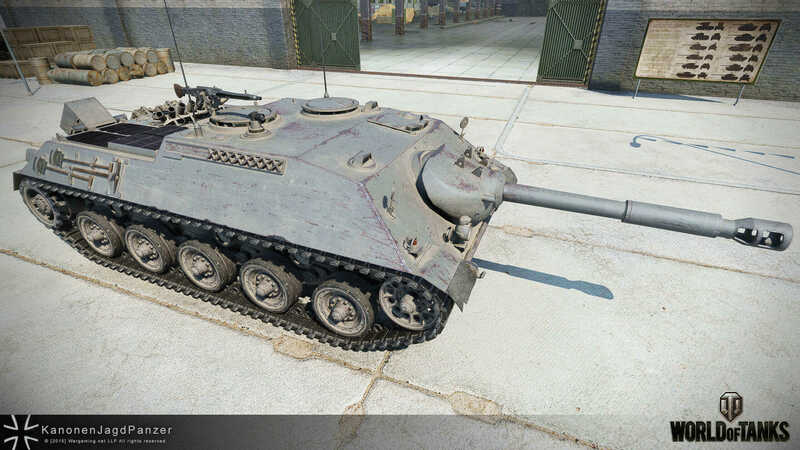 The Kanonenjagdpanzer is a master of distraction while your allies zoom in on destructing enemy vehicles. Even though the Kanonenjagdpanzer is not easy to master, it is still a very great vehicle to drive. In fact, compared to the E 25, it is way harder to play, not just because of the bigger size or higher Tier, but because it relies on your team mates and requires map awareness. However, if you are skilled enough, you will earn lots of credits in no time. We recommend you join a platoon of medium or light tanks to make your life easier. Also, after each battle you can be sure that every single credit was gained through proper and hard work. This tank feels really German. Read more about the Kanonenjagdpanzer here. Purchase this deal for yourself or as gifts for your friends. Please refer to the Premium Shop Guide for information on how to use it.